It's a mixed bag when you walk into your kitchen and find your cat peering down at you from atop the cabinet: On one hand, she should not be there; on the other, you have to admire her athletic skill. 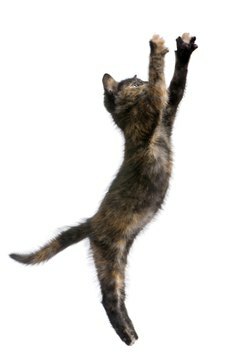 A high jump is no big deal for a healthy cat, who can leap up to five times her height. She looks so mild-mannered in her pretty fur coat, daintily cleaning herself or sweetly napping on a chair. And then your cat leaps, leaving enough daylight under her to impress Baryshnikov. How does she do it? Beneath that pretty fur are muscular haunches that propel her wherever she sees fit. A cat can leap approximately five times her height, so most healthy cats have around a 5-foot leaping range, vertical or horizontal. And those claws help her latch on, in case she's not sure-footed in her landing. As impressive as a 5-foot leap is, most cats pale in comparison to Nya-Suke, a cat in Japan who, according to Huffington Post, is able to leap almost 7 vertical feet. If you live with a leaping cat, be practical, for both your sakes. Keep important items, such as your grandmother's vase, out of harm's way -- such as behind closed doors. Provide her with cat trees that have height and interesting views. Keep tempting food off counters; when she makes her way somewhere she doesn't belong, give her a quick squirt of water with a spray bottle.